Welcome to Broland, a very old farm cottage, recently refurbished to provide a very comfortable holiday home for up to 4. 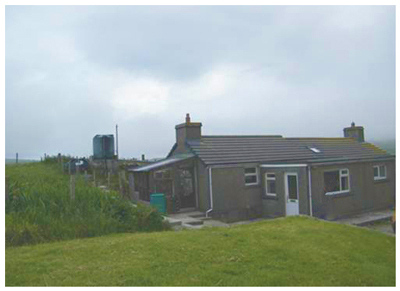 The house is nestled on the side of a hill, on the beautiful island of Rousay, one of the Orkney Islands. Broland is ideally located for exploring this unique part of the world. This small, cosy cottage is newly refurbished and decorated throughout and sits on 55 acres of its own land. The house offers 2 bedrooms; 1 double and 1 twin, a modern bathroom, a cosy lounge with a wood-burning stove, and a kitchen fully equipped with all modern conveniences. Nearby are opportunities to visit a 2000-year old broch and Neolithic burial chambers, or take a walk along peaceful coastline and climb a hill to look over a beautiful high loch. The island is renowned for its bird population. Broland is a great place to relax and recharge your batteries, while exploring some of the most interesting natural environment in the far north of Scotland. Please explore our website for more information on Broland, and discover the amazing and unique island of Rousay. From the Ferry Terminal, follow the road to the T-junction. Turn right. Follow this road for around 3 miles. Once you go past the Shop, it's the next right turn. The house is just down here on the left hand side.